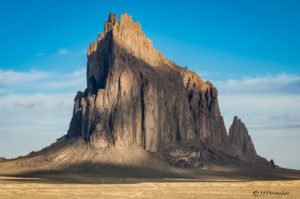 My latest adventure had me going to the New Mexico town of Shiprock, named after an isolated small mountain which rises abruptly on a virtually level plain. This mountain is sacred to the Navajo Nation and is part of their religion and mythology and referred to as the “Winged Rock” (English). I travelled from Santa Fe to Shiprock, starting out at 3:00 AM to arrive at sunrise. Being unfamiliar with the route I was a little late but spent two hours walking around and Photographing this majestic peak. While I did manage to get some decent images, I believe I will be making several more trips to get more striking images. the image below gives you a good view of this sacred rock. This entry was posted in Landscape Photography on November 1, 2014 by admin.